I See the World Through Pain Goggles, and You Refuse My Visual Voice. Graphic devices already constrain the landscape of our knowledge- making endeavors. Our work is haunted by assumptions about type, architectures of content, the visual conventions of a genre, the way we privilege masculinized logos/word over feminized eikon/image (Wysocki, 2008; Drucker, 2008; Lee, 2014; Mitchell, 1996). These same normative, ableist assumptions about the scholarly page — Times New Roman, double-spacing, 1” margins, paragraph indentations, established style guides — erase me, my authorial presence, and my research goals (Dolmage, 2012). Fibromyalgic, I am in constant pain, normalized through chronicity, inapparent to the unpracticed eye. I have to perform myself into visibility in the clinic and the academy, both of which attempt to impose a one-size-fits-all pedagogical standard on my body in the form of numerical pain scales and dissertation defaults. What I mean to say is, at the hospital in 2014, months after my appendix began perforating, a surgeon rooted around the calcifying ruin of my abdomen and dug out a psoas, a fallopian tube, a uterus-and-colon, glued, from all that septic rot. It took so long to receive care because I looked so well, even when my skin was turning gray. I am tired of composing in ways that look well. I could say it’s not fair. That conforming to your formats limits my ability to create opportunities for an embodied understanding of my experience, a sensory world that is always undergoing rupture. I could argue that chronic pain literally alters how I see things, shifting my visual midline, changing how I process and filter internal and external events, from peristalsis to a bump on the subway. At my follow-up, the surgeon drew me a picture of the procedure. Both our bodies leaned into it as he talked me through what happened while I lay in twilight: black dots for laparoscopic incision, the nested noodle of my intestine, and a turgid appendix, colon, uterus, fused in septic matter. Jarod Rosello (2017) remarks that “when we draw, we use our entire bodies.” I’m more writer than visual artist, but when I draw, for a little while, my attentional bias towards pain is reduced. I have so many reasons, personal and bodily, to value graphic social science. Drawing, considering layout and arrangement and interface, like Chris Ware’s Building Stories, it lets me make scholarship that doubles as respite and privileges the way I have to think (Chen, 2014); it lets me use the visual and haptic to question ocularcentrism. Pain is an extralinguistic confrontation with shadow, and chronic pain begs synesthetic activity in its expressions to be better understood. “Images force us to recognize the chasm between our different individual perspectives and the limits of language available to cross this space,” says Deborah Padfield (2011: 242) in her study of pain interpretation and the doctor-patient dyad. She’s referring to patient-created photographs that provoke a co-creation of meaning around the patient’s experience of pain. But drawing is engaging and embodied too, and admits something that photographs can’t: perspectives, positions, experiences, events that could never exist in reality. I conduct autoethnographic research on fibromyalgia. 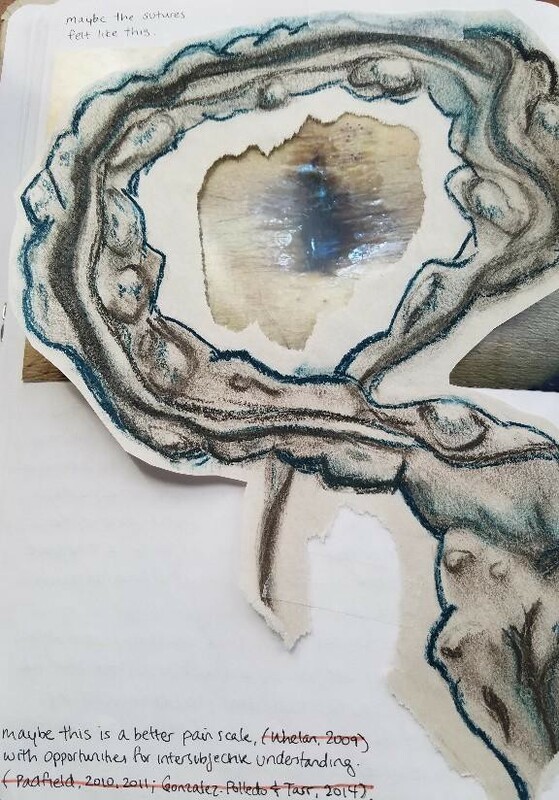 I share field notes and research findings in multimodal forms, including photographs, augmented reality tattoos that, when triggered, reveal something as visceral as blood on skin, pencil, pen, and charcoal drawings, scratchboard and guitar strings, Curious Skin cardstock. You say this work lacks theoretical rigor, but where’s the ready answer when I ask you if it’s because comics is a medium more willing to restore the body to the Ivory Tower, as infatuated as it is with the appearance of order, linear argumentation and agonistic logos/word, which add up to a picture of Western masculine rationality, which tells us pictures are feminine, irrational, unworthy of being called academic praxis (Lee, 2014). Pain wants to be worthy. Like so many mangaka with tendonitis or hand injuries, I too have bound my hand with tape and a pen to make a deadline. 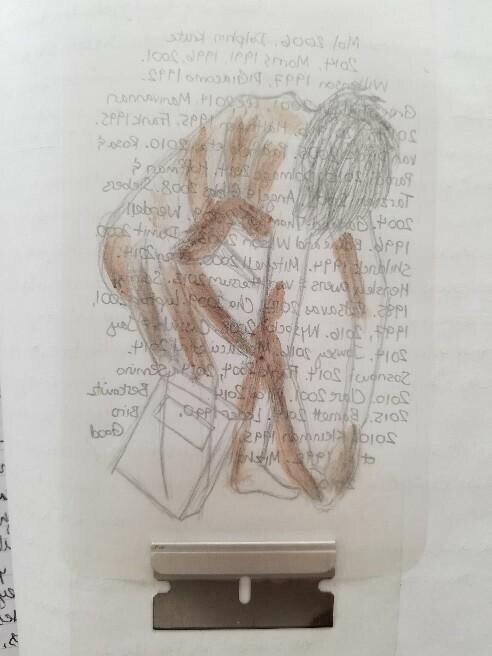 But unlike comics drawing, where the tremors and scratches of pain are preserved and affectively felt by readers, this bodily chaos can’t translate into the typed words demanded by institutional repositories and publishers. The exclusions are never fair. Pain bursts through all the containers I build for it with words. Comics and visual art might be considered a less than rigorous format, but they offer possibilities for sense-making that traditional scholarship doesn’t. Nonlinear, ergodic, extralinguistic, navigable in multiple ways, comics and non-sequential art permit me to visually express or complicate ideas, to world-build across genre conventions. In Cynthia Selfe’s (2009: 30) words, “We need a full quiver of semiotic modes from which to select.” I want sympathetic response. Pages that touch back. Images to vex the relationships between word and image, body and text, cognition and flesh, theory and practice, knowledge, understanding, empathy. Chen, M. (2014). Brain fog. Journal of Literary & Cultural Disability Studies, 8(2): 171–84. Dolmage, J. (2012). Writing against normal: Navigating a corporeal turn. In K. Arola and A. Wysocki (Eds. ), composing(media) = composing(embodiment): bodies, technologies, writing, the teaching of writing (110–126). Boulder, CO: University Press of Colorado. Drucker, J. (2008). Graphic devices: Narration and navigation. Narrative, 16(2): 140–62. Lee, M. (2014). The melancholy odyssey of a dissertation with pictures. Pedagogy, 15(1): 93–101. Mitchell, W. J. T. (1996). Picture theory. Chicago, IL: University of Chicago Press. Padfield, D. (2011). “Representing” the pain of others. Health, 15(3): 241–57. Rosello, J. (2017). How we endure writing, drawing, and remembering. International Review of Qualitative Research, 10(3): 242–51. Selfe, C. (2009). The movement of air, the breath of meaning. College Composition and Communication, 60(4): 616–63. Wysocki, A. (2008). The multiple media of texts. In C. Bazerman & P. Prior (Eds. ), What writing does and how it does it: An introduction to analyzing texts and textual practices (123–157). New York, NY: Routledge. The Graphic Social Science Research Network was established in June 2017 to help advance the practice of Graphic Social Science.